A few of you asked me about Oriflame after I featured their Caramel Tender Care balm in a recent post. I picked up a few products as part of a recent DealRush deal - and remember nabbing a purple eyeshadow from my mum when I was younger - but that was about as far as my knowledge extended. 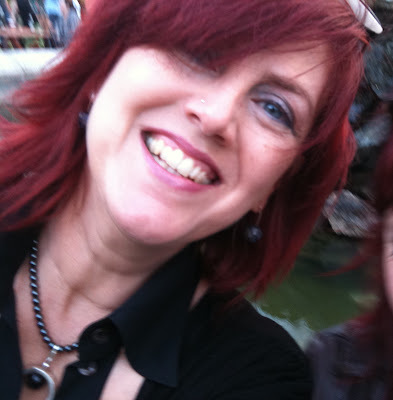 So I caught up with the lady behind the deal, Carol Fitzpatrick, to find out more. Carol’s enthusiasm for the company is infectious and she told me all about the 100+ scientists employed here in Ireland, her favourite Oriflame products, and how you can volunteer for a scientific study to advance the cosmetic cause! Tell us a little bit about Oriflame. The company was founded in Sweden in 1967 by two brothers and their friend, and is now an international beauty company selling direct in more than 60 countries. With an independent sales force of approx. 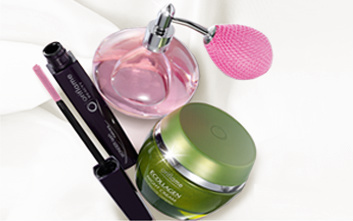 3.6 million, Oriflame has an annual turnover of €1.5 billion. There are more than 1000 cosmetic products in the range, inspired, designed and formulated by over 100 scientists at the Global R&D facility in Bray. Oriflame products are based on natural ingredients and never tested on animals. Where are the products available or how do you order? The products are available to buy from your local Oriflame consultant, online or from me through my webpage - I can post out a free catalogue to anyone who’d like one, just drop me a line at oriflame.ie@hotmail.com. I have been with Oriflame since 1984. I first worked in manufacturing before moving to the accounts department at the Research & Development facility in Bray. Oriflame is a fabulous company to work for and when my job was relocated to Stockholm, I decided to join the independent sales team. I joined up in February and am now a Group Manager with a very active team. We’re actually recruiting both part-time sales people and managers at the moment and if people are interested they can contact me for more details! You obviously love your job – tell us why? What I love about my job is that anybody can do this. Once you have drive and energy you can build a strong customer base and successful sales team. My plan is to become Regional Manager in a few months. My friends joke that my coffin will have the Oriflame logo on the side! Is it true that all new products are developed here in Ireland? Yep, all the research and development of new products are carried out in a state of the art facility in Bray. We have over 100 scientists working in different areas: skin, colour, toiletries, claim support, packaging and registration to name but a few. Studies are carried out in Bray to confirm the claims that we carry on our products, and to give our formulation scientists immediate feedback. All studies are carried out on volunteers and strictly monitored. To take part in a study, have a look at www.ori-derm.ie - I have always found it great fun to take part, and feel like I've made a contribution to future beauty! Can you tell us about some products that have been recently launched? We’ve just launched the first two products of our cosmeceutical skin care range - Bio-clinic Lifting Power Concentrate Day and Night (€35.95), which has taken 5 years to develop and combines 3 advanced lifting actives: Pure Retinol, Hyaluronic Acid and Contraction peptide. I am a true believer in this as it has really lifted me ol' jowl department. The second is Bio-clinic Soft tint Red Reductor Day and Night (€37.20), which contains Aescin to improve micro-circulation and reduce facial skin redness and dilated capillaries. I have a red nose and chin (extremities!) and this has reduced my need for concealer. My mother swears by it! What are the top 3 best sellers? First up would be Tender Care (€10.95), a little pot of moisture heaven. Emma, you have already reviewed the caramel flavoured one. The original has no fragrance. It contains beeswax and you can use it on your lips or any dry area; a little goes a very long way and it lasts forever. I've got pots everywhere, on the desk, bed side table, bathroom and more than a few handbags. Power Shine Lipstick (€10.95) is another bestseller - this comes in 15 colours and gives glittering 3D sparkle, shine and moisture. It smells of fabulous watermelon, mmm….The third would be Wonderlash Mascara (€9.95) which has always been a favourite of mine - when I can get it back from my daughter. It comes in 3 colours, black, brown, and prune, and has a plastic bendy brush applicator to really separate the lashes leaving no dreaded clumps. What are your other favourites? Ahhh my personal favourites, where shall I start? As you can gather from all the above I'm a bit of an Oriflame ho! On a desert Island I would of course let myself go, who would see the state of me?!? But at the moment I can't go without; Even Out Dark Spot fading concentrate (€17.95) dotted on to some pigmentation on my neck; Bio-clinic lifting cream on my neck and jowls; Bio-clinic red reductor on my nose and chin; ecollagen anti-wrinkle eye care (€12.95) around my eye area and ecollagen anti-wrinkle day cream (€28.95) for the other bits I've missed! Was that TMI? And that’s before I put on any make-up! Have you learned something new or were you already familiar with this brand? And if this has piqued your interest in Oriflame cosmetics then keep an eye on the blog, because there just might be a giveaway coming up soon! WOULD LOVE TO KNOW WHICH (FOR YOU) IS THE BEST DAY, NIGHT CREME AND SERUM AND EYE CREAM? Always been curious about Oriflame! I saw that deal but I wasn't sure cos nobody seemed to know anything bout them!! @tedore, are you looking for Oriflame recommendations or recommendations in general? Carol, if you read this, maybe you can help? @Rachelle, Roxy, Claire, I know - so interesting! So much I didn't know. Love that all the products are developed here. Can you tell me your skin type and age? You can get me at oriflame.ie@hotmail.com if you prefer. Great post, I must admit that Oriflame is a new brand on me but their stuff sounds great.